Voici l'histoire du symbole que dédé portait en pendentif et en boucle d'oreille au début de sa carriere . Depuis 1993, il porte un anneau en boucle d'oreille donné par michael bolton suite à la perte de l'ancienne . These were heady times for everyone involved. I met a boy with a fiery heart named Andre Agassi, and was surprised to learn of his deep faith; a faith he shared openly with the extended family which Nick and his wife Kelli created for the young students. I found great inspiration in their spirituality. 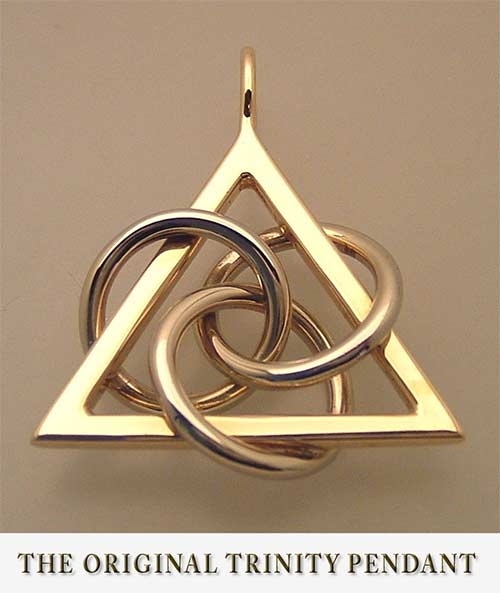 During this time I designed my most prized piece; the Trinity Pendant. It was originally designed for Kelli Bollettieri, as a symbol of her deep Christian faith. Kelli asked for a object with three equal sides that would represent the Father, Son, and Holy spirit. 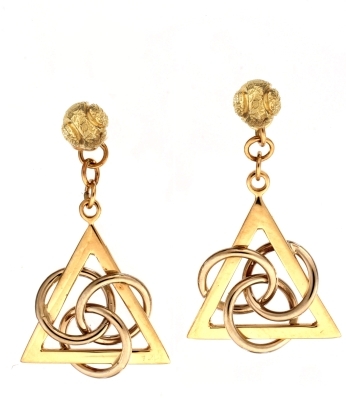 I decided on a triangle for its mystical and Spiritual powers. I added three unending circle for eternal love and made the circles in white gold to symbolize purity. I intertwined the circles with the sides which completed the message of Pure Eternal love for the Father, Son, and Holy Spirit. She prized the trinity pendant, and asked me to make a matching piece as a gift for Andre. He wore the piece in public for many years, and it seemed to bring him luck at times. 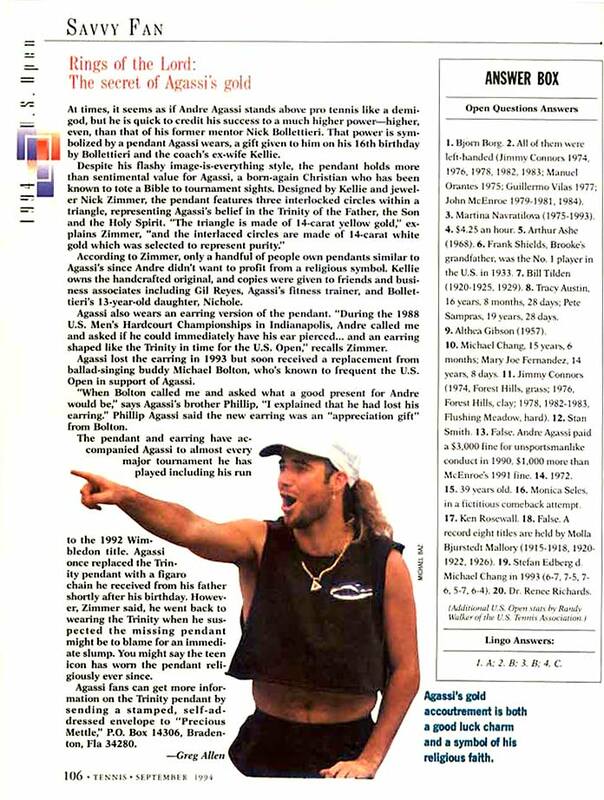 In 1987, just before the U.S. Open, Andre asked for an earring version of the Trinity Pendant. I had very little time so I used a smaller pendant I had designed for Nicole Bollettieri, Nick’s daughter. I attached a wire hook and shipped it to New York. When Andre returned to the Academy he said the wire hook got caught in his hair, so I made a small half tennis ball on a post. He wanted it to dangle, so I attached a couple small rings together. The Trinity Earring was born. Andre went on to win several Grand Slams while wearing the Trinity. He had matching pieces made for Gil Reyes and a few close friends. The tennis media recognized the trinity pendant, and noticed that Andre’s career spiked during the periods he wore it. An article in Tennis magazine brought attention to Andre’s relationship with the pendant, and I began getting requests for similar pieces.